Everyone knows that the Lannisters have more money than most of Westeros combined. Their deep pockets allow them all sorts of luxuries that a commoner can hardly even dream of. They are even able to fund research into the sciences, pushing the boundaries of what mankind knows. Of course, one doesn’t become so rich and powerful with all of their scruples still entirely intact. And the Lannisters are hardly squeaky clean when it comes to all of their dealings. This month’s releases for the Lannisters in the A Song of Ice and Fire: Tabletop Miniatures Game show the two extremes of the House. Let’s take a quick look at both and see just how far apart the two units can be. With Robert Baratheon dead, the Lannisters are poised to be the ones who control the Iron Throne. They certainly intend to maintain that hold. In the War of the Five Kings, they are the ones in the highest position of power at the onset. With their ingenuity and means, it will be difficult for the other Houses to push them out of King’s Landing. These new Unit Boxes will go far in making sure Lannister players are the ones left on the field at the end of battle. These new units will be available in your FLGS on October 26. 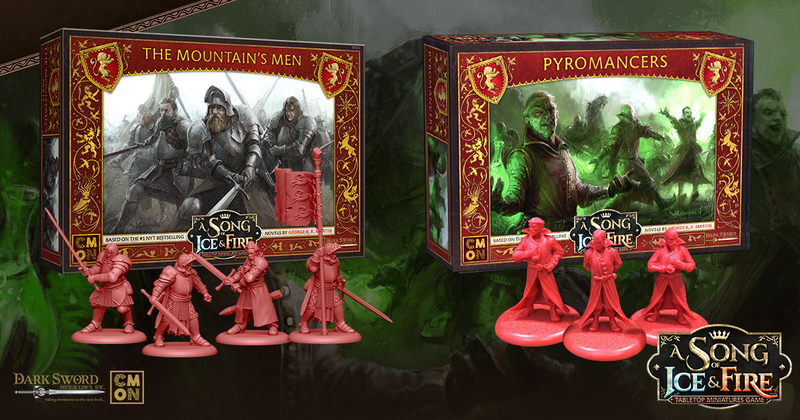 You can find out more about the A Song of Ice and Fire: Tabletop Miniatures Game here.